On November 14th, the City will be making a presentation at the College Area Community Council on how they intend to further improve bicycle safety along Montezuma Road. The agenda [pdf] states that the presentation will happen pretty early in the meeting and Brian Genovese the Senior Engineer at the newly formed Multi-Modal Program at the City will be making that presentation. Genovese is the City Bike Coordinator's, Tom Landre, supervisor. As of this year, a new California law allows jurisdictions to round down the speed limits after conducting a speed survey. Montezuma Road, despite being a major east west thoroughfare connecting La Mesa to points east in the City of San Diego, was not listed in the SANDAG regional bike plan. It is however, listed in both the 2002 City Bike Plan and the 2011 Plan Update as a thoroughfare needing improvements. What is interesting about our proposal to reduce the vehicular travel lane by adding protected bike facilities is that this will reverse the City's repeated habit of widening the road to accommodate vehicles without any consideration for the safety or quality of city life. At the same time, the City was busy widening roads all along the College Area Community to accommodate vehicular traffic instead of providing residents with additional transportation options. The cycle of widening roads, and then conducting speed surveys that noted increased vehicular speeds created the perfectly bike unfriendly Montezuma Road that exists today. San Diego State University certainly didn't help matters by banning bicycling on campus (which they've since tried to rectify). I checked into getting new speed surveys on Montezuma but the existing surveys have been signed-off until they expire, i.e. they are good until 2014. However, we may be able to get new surveys after we implement any bicycle facility improvements that could trigger a change of conditions. As you may have heard, we are working on a corridor study that will include recommended low-cost-low-effort early action treatments. Separated cycle tracks or raised bike lanes will be considered but will likely fall into the category of higher-cost-higher-effort treatments. In the absence of maintaining the status quo of doing nothing or very little at all, building separated and protected bicycle facilities such as cycle tracks are certainly expensive treatments. Bike facilities are only expensive when viewed in a vacuum and not in light of the fact that they are a mitigative measure against maintaining an incredibly expensive automotive-based transportation network. In light of rising gas prices and the continuing economic recession, not providing residents and visitors with increased options to move around is not an effective way of ensuring the city's success or relevance in the coming years. Stating that the bike facilities are higher cost or higher effort treatments ignores the incredible return on investment that bike facilities provide cities. If San Diego wants to stay relevant as a city in the years ahead, its about time that the City's decision makers cast aside the belief system that is not only false but also harmful to our city's future. Despite the message from Councilmember Marti Emerald's office to not have Chuck Gilbreth's ghost bike removed, the City of San Diego did so anyway. The Storm Water Department Spokesperson, Bill Harris, chose to instead make up facts about where Gilbreth's ghost bike was placed insinuating that Gilbreth's ghost bike was blocking wheelchair access or right-of-way regulations - when the ghost bike wasn't blocking any sort of access except serving as a grim reminder that our city streets aren't safe for bicycle riders. A couple of local advocates including Penelope Robles then tracked the ghost bike down and reported back that the ghost bike was now located downtown and that after chatting with with Harris, Robles learned that the Storm Water Department would return the bike if someone went down to the City Administration Building to pick it up. I contacted Forrest Brodsky who is one of the many volunteers at SDSU's Bike Cooperative, The Bike Stand, to learn whether his organization intended to pick up the ghost bike to return it to its original location. The Bike Stand was the group that originally placed the ghost bike to honor Gilbreth's life. Brodsky said that he would first contact Gilbreth's family to ensure that replacing the ghost bike would be in line with and respectful of the Gilbreth family's wishes. This morning Brodsky informed me that Chuck Gilbreth's widow, Ginny, was more than willing for the ghost bike to be replaced at its original location on Montezuma Road - a road that has yet to see any road design improvements that would make it a safe corridor to ride on. Angered that the City of San Diego plans on removing the ghost bike placed to honor Chuck Gilbreth's life, riders and other supporters will be protesting all day tomorrow (July 12) at the location where Gilbreth was killed. This will be an all-day affair. Please feel free to come earlier or later than the posted time. 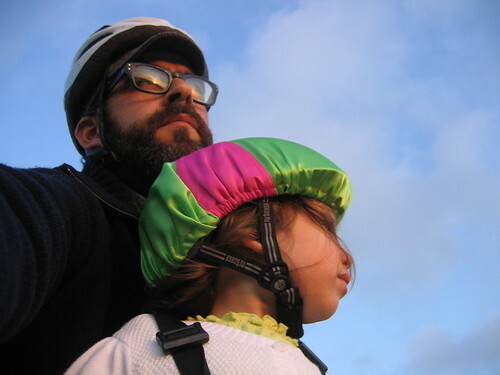 Chuck Gilbreth was tragically killed by a pickup truck on April 18, 2012 while riding his bicycle in the east bound bicycle lane on Montezuma Road. Please ask your City Staff to not remove the ghost bike on Montezuma Road near Collwood Boulevard until the road safety improvements have been made to Montezuma Road. The city Transportation Department is studying the traffic road conditions relative to bicycle rider safety and should submit a report to you shortly. Please do not remove the ghost bike until bicycle safety improvements have been made to Montezuma Road. In a city that was built around the automobile, it has taken a recent death and a subsequent memorial ride honoring the dead rider in order to get our elected representatives and the city staff to note that our existing transportation network does not accommodate all San Diegans in a manner that is safe, efficient and comfortable. I request that you initiate a study of the roadway design of Montezuma Road between Fairmount Avenue and 55th Street, with regard to bicycle safety. Montezuma Road is a very important link in the City's bicycle network, providing one of the few routes for bicyclists traveling east to west to/from a large area of the City and County of San Diego. As you may know, a cyclist was killed on this stretch of road on April 18, 2012. While to my knowledge, the preliminary reports on the accident indicate that roadway design was not to blame, I find there is significant evidence and testimony that this area is dangerous for cyclists. I believe this corridor is in need of study to determine if additional measures are warranted to improve bicycle safety. The use of bicycles for commuter and recreational travel offers public benefits for those who ride and for those who do not. The City needs to do everything it can to protect bicycle riders and thereby encourage more people to ride. 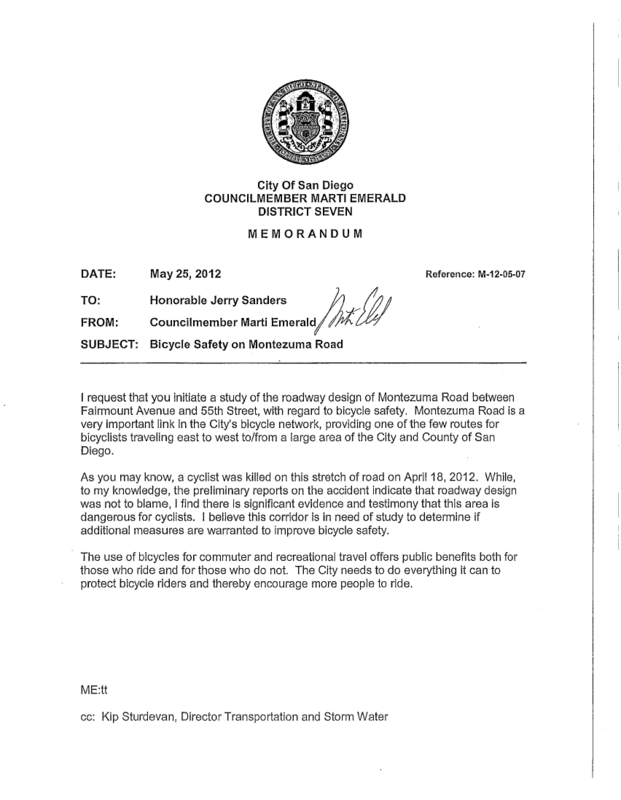 This is in response to your May 25th, 2012 memo regarding bicycle safety on Montezuma Road. As requested, staff will perform an assessment of Montezuma Road between the limits of Fairmount Avenue and El Cajon Boulevard to determine if further measures can be implemented to improve bicycle safety. We will respond within 90 days with the results of our investigation. Much thanks to Tim Taylor, Council Representative for Councilmember Emerald, for both following up on my initial request and ensuring that this one death would not be forgotten. I will post subsequent updates as I learn of them. I mostly enjoy my commute from home in La Mesa to Linda Vista, where I work as a professor at the University of San Diego. I ride quiet neighborhood streets until Montezuma Rd, where the bike lane appears and disappears, then descend the hill carefully before taking the bike bridge over the 8 interchange, after which I'm unceremoniously spat out right into traffic as I try to hurdle speeding vehicles to make the left turn along Camino del Rio North. I’ve learned a few tricks in trying to get over to the left, but its often rather hairy. Then, it’s a lovely ride along the river on Camino del Rio, then through the strip malls of Mission Valley, cutting through Fashion Valley to Friars Rd., then up to campus.